Album has slight toning around the edges of each page. We get this from my wife mom who past a way.T44x4, T15x3, T28x4, J59x2, J45x1, J46x1, J48x4, J21x1, J13x1, J44x2 1 envelop. Asien Sammlung Ab Klassik mit Japan gestempelt und postfrisch!!! Es sei denn, es wird vorher mit mir etwas anderes abgesprochen. Ich mache keine Beispielbilder Sie kaufen genau das was Sie sehen. Siehe Fotos. Ich habe alles abgebildet. Which he paid in the 1960s. 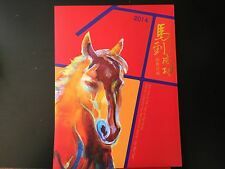 This is a 2014 Chinese lunar new year of horse full sheelet stamp with limited cover forlder. Thank you for looking. Please feel free to ask me any questions. Thanks. Hong Kong 1962 – Exhibition Emblem – olive – cancelation mark. 1970 – Household and population Statistics – 1b – cancelation mark. Included in this lot are the following 25sen – Olive Green – cancelation mark. ASIA X30 DIFF. NON-UK WINNERS OF. AFGHANISTAN & BAHRAIN. VALUES/SG Nos. from 2012 Catalogues. 100% Genuine with Guarantee.$6.00 Certified or Priority Mail for USA,$15.00 Registered Mail for International.Payment must be received in 3 days,the item will be sent out in 48 hours after the payment received(Except Sat.& Sun. ).If you don't agree to above statement,please don't bid. FAR EAST COUNTRIES COLLECTION: (310) ALL OR NEARLY ALL DIFFERENT STAMPS! Includes: China Cochin(19), Hong Kong(79), Indochina(35), Indonesia(73), Korea(71) & Manchukuo(33). This would be a great base to expand upon for this country. Anderson Stamp & Coin. Karl Anderson. (CMD22) China and Taiwan stamp collection, 1898 to 1972 on 26 album pages and 2 Hagners - SG value £312. Nice old collection back to the 19th Century. Album has thick hard pages. 100% Genuine with Guarantee.$6.00 Certified or Priority Mail for USA,$13.00 Registered Mail for International.Payment must be received in 3 days,the item will be sent out in 48 hours after the payment received(Except Sat.& Sun. ).If you don't agree to above statement,please don't bid. Hong Kong , North Korea, South Korea, Nippon, India, Malaya, Pakistan, Mongolia, Thailand - Lot of Stamps I collected these stamps with my grandfather when I was a child. Sadly, I need to reduce my collection. I’m not a collector these days so hope they will go to someone who appreciates them. Several other auctions will be listed in lots of country/age. Umfangreiche Sammlung ab 1906 bis 2001 im Steckbuch. Bis 1947 ungebraucht, ab 1949 postfrisch. Txzj pxzj17413 txzj-11 txzj19 txzj115. PRC China stamp year book 1992 MNH. Most of them have been hinged and are safely contained in Vario sheets. Kaufen Sie auch nicht. Die Marken sind gestempelt und in unterschiedlicher Erhaltung. So wie im Einsteckbuch vorgefunden. Bei in diesem Sinne unnötigen bzw. Das wären Verstöße gegen internationales Handelsrecht. Detailbilder ;. Deutschland / Germany. Der Verkäufer speichert den Vertragstext nach Vertragsschluss selbst nicht und der Verkäufer macht den Vertragstext dem Kunden auch nicht selbst zugänglich. See photos (sorry about the colour, best I can do). The lot is almost all large topicals, with complete sets included. The scan shows a representative sampling of the lot. This is a very nice grouping, and well worth our low price. Type Collection. This of course costs more than a standard letter but saves everyone a great deal of unnecessary expenditure. anything else.